FROM HOME AND THEIR LOVED ONES. Are there any more difficult to cross borders for Romanian citizens? The distant West seems to say that no, not now when the privilege to be part of the exclusive club of Europe has been de jure given to this population. Granting a considerable transborder mobility comes though with a price: the duty to contribute at the consolidation of the fortress Europe. The borders that shelter the so-called values of civilization stretch today to Romania and must be defended in the face of the eternal barbarian hordes. Europe's imposed request by is not just a condition or a paternalist remark. It is an attempt to erase the recent memory of the suffering endured by those here, of all the humiliations of Romanian citizens of not being Christian, white or civilized enough. And to negate the continuation of these injustices today. The Migrant's Monument is the never realized promise of the celebration of this memory. Because the suffering, the humiliation but also the resistance and solidarity continue in the migrant context, as long as there will be national and international borders. People of various ethnic backgrounds who circulate Europe and the world more easily than others because they posses Romanian citizenship, part of the EU, could have more in common with those coming from Cameroon, Vietnam, Syria or Peru. Difference and similarity do not reside in ethnic origin but in the role prescribed by the labor apparatus of the construction of the "European civilization". For all of the populations of these countries these are especially those of the caretaker, maid, the cook, builder and driver, waiter and babysitter. And, like these, Eastern Europe has not disappeared after 1989 but simply put in a place of invisibility. The Migrant's Monument is an intervention in the field of the representation of national identities situated in the transformative context of migration. Seen as a solidarity message, the plaque carries both the impossibility of remembrance and honor by local authorities and the hope for collective dignity. The figure of the foreigner (stranger) is central both to European identity and to national identities within the EU. Romanian citizens constitute for years a special category of foreigners for Western eyes: never sufficiently European, civilized or white. This representation is applied, although in a different measure to persons outside of European space that manage to arrive in Western Europe. Romania public space has taken up this representation, putting an apparent distance between the foreigner from Romania in the West and the non-European foreigner in Romania. But the two conditions are much more alike than apart. This project seeks to explore such representations and the possibilities of transforming them with the aim of transborder solidarities. In support of the Freedom March 2014! 3. A public debate: "Strangers across the borders and strangers within the borders", with Bashar Al-Kishawi, Simina Guga, Veda Popovici, David Schwartz on 22.06, Salonul de Proiecte. View of the installation in the bus station. (Collective) Dignity and (the Rhetorics of) Belonging. A fragmented history of the production of national identity in arts and the cultural realm in Romania from the 70s up to now. The strive for dignity and the need for belonging are arguably the most important elements that nationalism promises to satisfy, making them chief drives to be reclaimed for a more emancipatory politics. Nowadays, while nationalisms regain collective affects and reshape contemporary subjectivity all around the world, it has become a pressing issue to critically position oneself and start writing back the idea of the nation. Dignity and Belonging is precisely an intervention in this field of subjectivity production. It is however an intervention, which both theoretically and methodologically opposes any essentialism of the nation. In other words, in my approach I tend to regard nation and nationalism as continuous processes, as permanently re-enacted strategies within a tactical field of power, rather than as fixed or static identities. 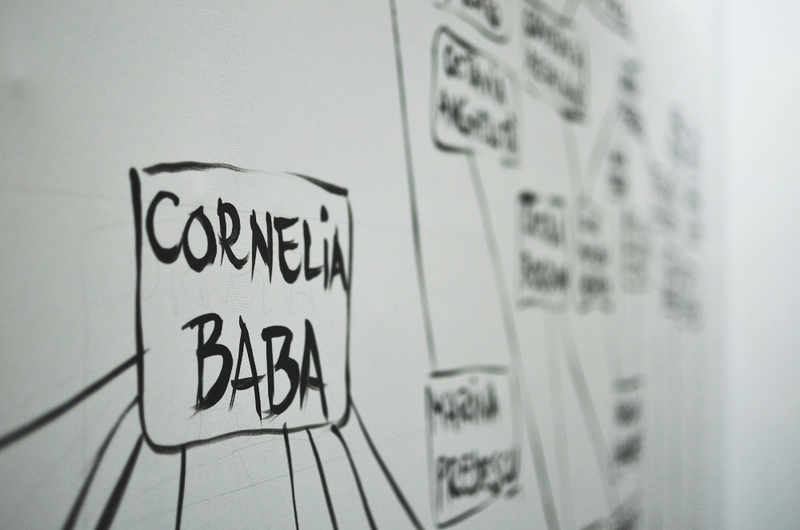 The course is based on the analysis of artists, artworks, exhibitions, art institutions as well as other cultural objects that have modulated the discourse on the nation in the Romanian context from the 70s nationalist shift of the Ceausescu regime until today. It also focuses on analyzing the hegemonic elements within the westernising effort of the local artistic canon in the given time-span in the context of recent exhibition projects about contemporary Eastern European art. Drawing from the work of de- and post-colonial scholars such as Mignolo, Balibar, Bhabba to nationalism studies personalities such as Anderson, Chatterjee and Verdery, the analytical framework is ascribed to the context of regional (Eastern European) and local (Romanian) collective identity representations. The invention of tradition, the East/West dichotomy, the function of the idea of Eastern Europe, the relation between the nation-state and global capital, the desire for and aura of the West or the potential of hibridity and a transnational horizon are just some of the reflections that will be developed in the course. Issue 5 of the Gazette of Political Art addresses the relation between art and gentrification. You can browse the whole issue (in Romanian) below or download it here. 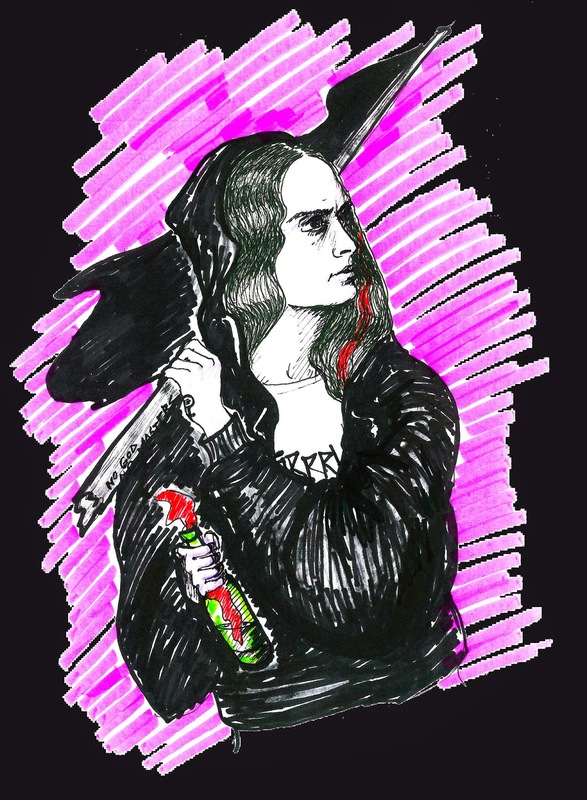 A fragment (in English) of the article "Delivering the City into the Arms of Capital: Gentrification and the Harmlessness of Art in Bucharest" here. The third performance of the Story of the Fall took place in the frame of the performance series "Just what is it that makes today’s performances …". This issue addressed feelings of identification of the participants as inhabitants of a Western city, Muenchen. Who is the Other, who is the We and how can radical imagination be enacted in that specific context are some of the questions raised. Views of the performance. Photo credits (all three): Thomas Splett. In the past year we have went out to several protests, sometimes enthusiastically, other times just to help raise up the critical mass. Various causes, from saving Rosia Montana ad stopping shell gas exploiting to blocking the mediation law or the law for the so called euthanization of stray dogs have shown that the solidarity they all promote is an idea much more complicated to put in practice than it might seem. Maybe on some occasions we had to purposefully leave behind our pink (LGBTQIA) or purple (feminist) flags because they weren't that compatible with the rest of the actual or virtual flags to be found in the street. And maybe sometimes we left the flag home without being aware of it. It’s time for queering the protests. As a result of the workshop, the pink triangle was created. Continuing a history of positivising negative, opressive appeals in the frame of feminist and lgbtqia movements, the pink triangle is a direct reference to nazi camp denotation. By positivising the symbol, the collective gesture is meant to affirm a political identity at the intersection of radical feminist, lgbtqia and anti-authoritarian politics. Comprised out of two elements: the public installation, visible from the windows of the gallery space and pink felt pins, used at the LGBTQIA Pride in Bucharest several months later. 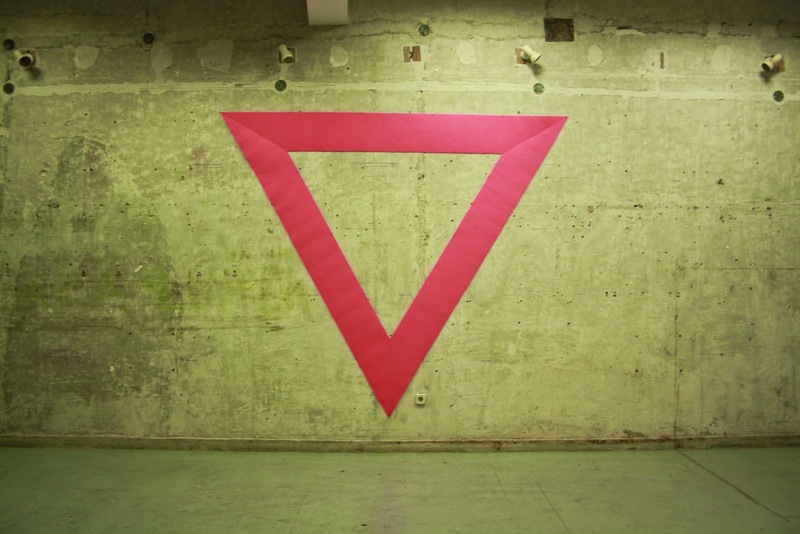 Pink Triangle, felt, 1.6m each side. View of the installation. Felt pins used at the Bucharest Pride several months later. Street view of the installation. With the rapacious corporate rush for Gold in Romania and beyond, we need to remember what it all comes down to: plus-value. Dear Money - pink ten lei bill dedicated to the greatest Romanian painter and his brush - be good and behave, let yourself be devoured. 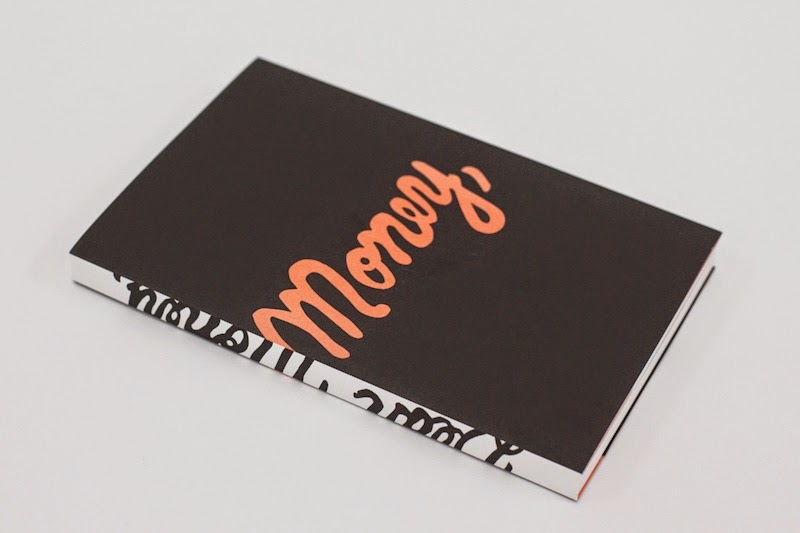 We already know the latest scheme on art: it is the greatest commodity of all. Destroy Financialization. Reappropriate Gold. Save Rosia Montana. View from the exhibition. Viennafair 9-13 October ,2013. The Story of the Fall is a post-apocaliptic story that retells how the end came about. 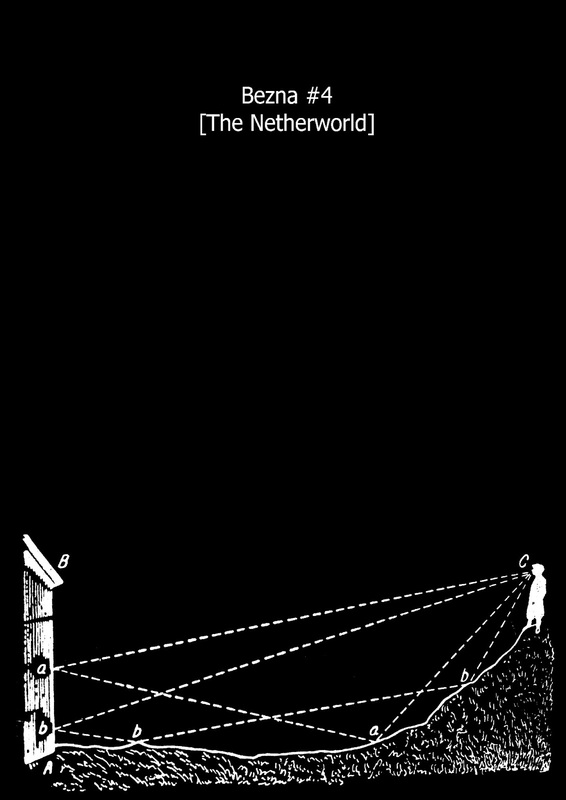 The Fall designates the process of the end of the world. The story is told as an event that already happened, placing the Storyteller (myself) and the audience in a near future. Performing the Story is, thus, an act of remembrance for an audience probably too young to know or remember the events. 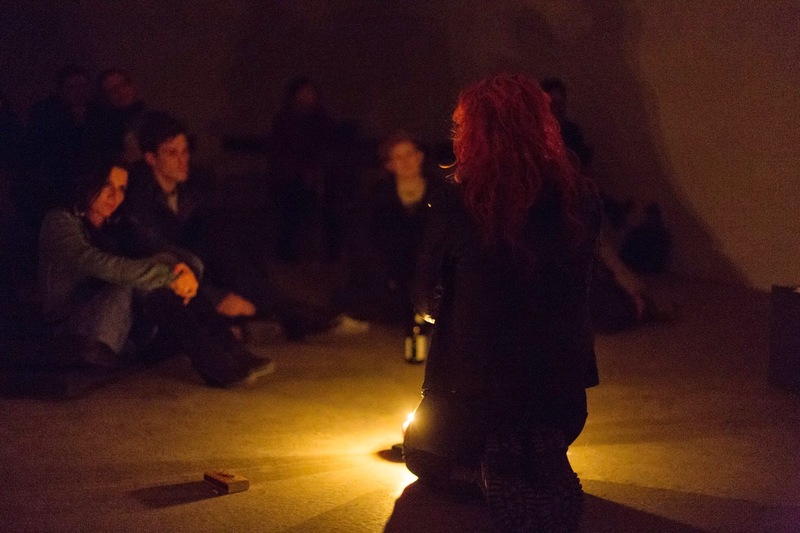 Told in a dim, dramatic candle light, the performance incorporates two other performances: 1. illustrating the Practice of the Now-Fall (see images below with Now-Fall Training - NFT illustrations) and 2. illlustrating the practice of the ReRaProp (Retro-Radical-Prophecy). 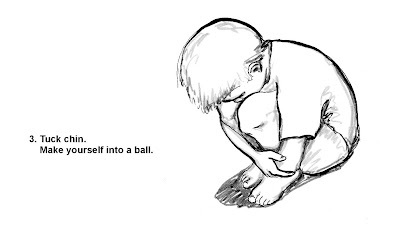 The Practice of the Now-Fall consists of various exercises on how to fall without getting hurt (see illustrations below) while the ReRaProp practice consists in anonimously performing a text considered to be a Retro-Radical-Prophecy, meaning texts that preceed the Fall and anticipate it considerably. 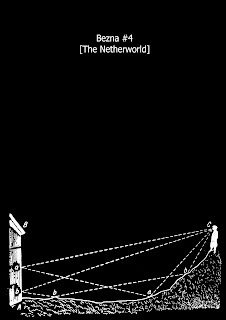 In this perfromance the text used is the „Introduction” by Jean-Paul Sartre to the Wretched of the Earth by Franz Fanon. The perfomance of the text is interrupted by a reading from Fanon's Black Skin, White Masks. The Story of the Fall is primarily an exercise in political imagination. The powerfull feeling of no-way-out is an important factor in maintaing the status quo of intersectional systems of opression. Constant political imagining is crucial to destabilizing the field of representation. The idea of apocalypse is a radical esthetical vision and can be used as a tool for radical political resubjectification. The Story of the Fall is an attempt to build such a context of transformation and help pave the way for an important twist in collective representation: linking local and regional (Romanian and Eastern European) conditions with the context of the global south via postcolonial and decolonial concepts. In a way, the Story of the Fall can be viewed as a complex fiction to trigger identification (of the audience) with the ideas of Franz Fanon. It also brings into question racism and anti-racism, a very important issue in the Romanian context by questioning what could be the roles of people like myself (Eastern European „white”) in the anti-racist struggle. >>> Excerpt from the Story. It soon became very obvious to many that the Apocalypse culture developed by the entartainment industry was nothing more than one of capitalism's typical strategies ment to anticipate and incorporate. At first, some were still excited about it, but soon people got massively disenchanted. What were supposed to be scarry, dramatic movies – thrillers as they called them – were massively making people laugh until they cried. It just looked like a poor imitation of the real. A poor expression of a great collective fantasy. It became clear that what was happening was something far from the reach of Hollywood. (...) It merely passed several years, when the idea of the Fall appeared. Sprung from the people concentrated on developing a praxis, the Fall strategically contained all of the great components of the Slogan. The Fall is neither an ideology, nor a belief. It is merely a vision. It was this indefinite character of the Fall that made it able to resist cooptation. Of course, it took a lot of time and a lot of blows that had to be diverted but in the end, it worked. Even in its most difficult moments there where at least a hundred thousand people practicing it on a daily basis. >>> Drawing from the NFT #4. >>> See full handbook below. The Second Body and The Multiple Outside - Alina Popa As long as we are caught in the present available body, there is indeed no outside. The problem is not that there is no outside, but it lies precisely in the fact that we are caught in the same outside without working with it. There are multiple outsides to be produced. Even an outside devoid of human and without thought. Shadow Body (Second Body) - Florin Flueras Shadow Body is a concept but it can be also a concrete unvisual, ungrounded, unknown body, a second nature or even the body that flies in your dreams. Shadow Body is not so much about what exists or what is possible, or about what you can comprehend or validate, Shadow Body is not a body that you have, it is rather a body that has you, it is a concept through which the unknown can abduct you. The Story of the Fall - Veda Popovici "Generally a relaxed body results in fewer injuries in falls." 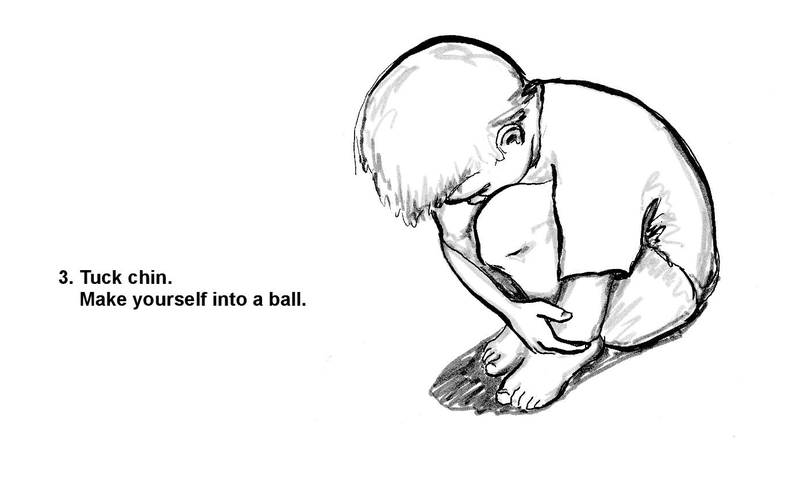 excerpt from the FFI (Full Fall Instructions). We welcome all to the lecture of the Story of the Fall. This story, told today, after it happened, counts as an act of remembrance and re-learning the New Fear. Springing out of the hybridization of banal darkness with exceptional darkness, it is this New Fear the emotion to trigger the Full Fall. The Outernational Condition - Ion Dumitrescu For someone in front of the Iron Curtain (looking over the fresh ruins of the wall) the east seemed an unmolded territory with resilient subjects living in geo-political dim light, humanoid silhouettes agitating in obscurity, apparently not fully developed, too weird to live too rare to die, craving to break in the international habitus. They appeared incomprehensible and unevolved on too many levels. It was only later that these outer-subjects were tamed and transformed in voracious consumers. Microbification and the Politics of Noise - Irina Gheorghe In the utopian construction of a new world, the borders with the already existing one is clearly marked and fortified. Under the terror of invasions, infiltrations, infections, autonomy and immunity seem to be the only alternative promises. But when interior and exterior are already contaminated by one another separation becomes impossible and resistance annihilates itself. 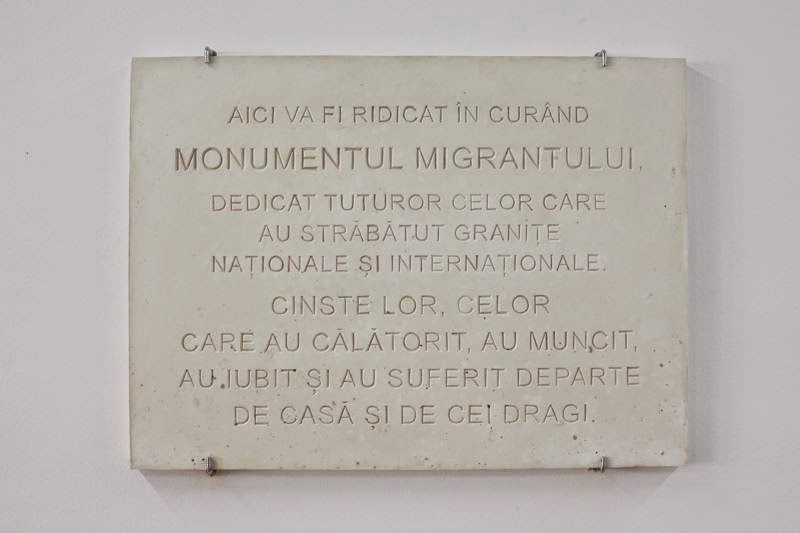 Centrul de Calcul Bucuresti - Ștefan Tiron + Claudiu Cobilanschi (side event, Wednesday, 26 Jun, 11h00, guided tour in the Museum of Politehnica University, Bucharest). Centrul de Calcul is interested in obsolete forms of knowledge, in retro-futurisms, in the bulky, outrageous and unwarranted nationalistic craze about inventors but also the accidental rediscovery of naive savoire faire that, to us at least, is in need of radical reappraisal. In the name of the father is an impossible physical performance in which the body of a woman confronts the oppressed position which she occupies through self-violence. By violently enacting the specificity of a womanly body, this body (my own) speaks to „the father”, an entity encapsulating multiple oppressive entities: the father – head of mononuclear, heterosexual family; god – head of christian religion; capital; empire – as the geo-system of colonialism and neo-colonialism. 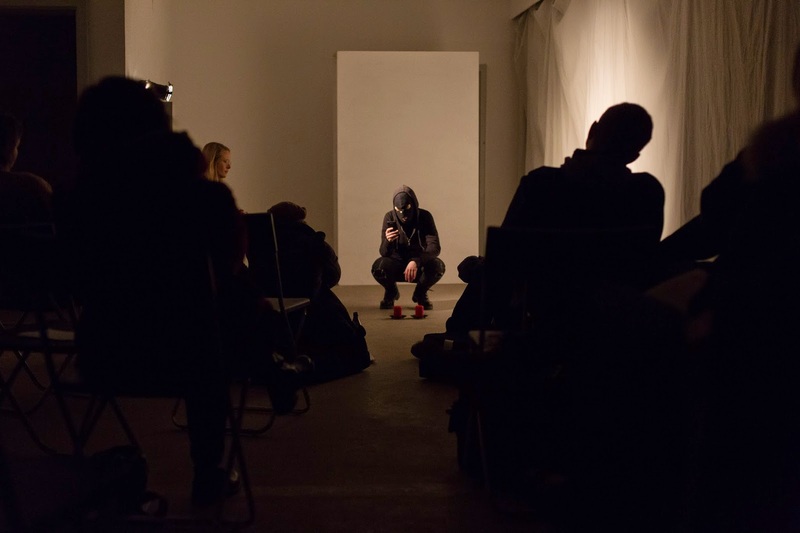 The performance initially proposes a seemly submissive posture – on knees, head covered – performing an equally submissive ritual – a prayer only to try and appropriate them in an emancipatory dimension. The anti-prayer is a ritual of revolt and killing, of empowerment and rejection. Not a curse, the anti-prayer is a painful ritual in front of an icon representing the ideal physical expression of the performer. The performance ultimately addresses some key radical feminist debates: emancipation through violence, essentialism and culture-based identity, cisidentity and queer. Also it opens the question of the intersectionality of the oppressive structures sketched above from the character of „the Father”. >>> Fragment from the text: >>> The icon, drawing. „In the name of the Father. I look for You, I dig You out. How much pleasure can we afford? A woman turned upside down. How much light can you afford when the light is not yours? It is someone else's. sink it back and it won't be enough. The whole world remains to be devoured. A destructive desire. A hand. And with the other I'm making a cross. In the name of the Father.In the name of the State. In the name of the Empire. In the name of Capital. In the name of You, Masters, I clog myself. I silence myself. Cover myself. Blind myself. In your name I turn my refused gaze in myself. The lacking Rib? But I am Lack itself. In 1961, Franz Fanon’s Wretched of the Earth is published in France with a preface by Jean-Paul Sartre. The event, by way of publicizing one of the great works of anti-colonial literature, affirmed (once more) the necessity and urgency of anticolonial and decolonial struggle in Europe. Sartre’s contribution, a Western voice confronted with the urgency of the anticolonial project, is a landmark for the history of the White, Western position in the anti- and de-colonial struggles. Four years later, Jean-Paul Sartre together with Simone de Beauvoir travel to Nida. A famous picture depicts a dark-clothed lonely white man, walking on sand dunes effortfully in the strong wind. The sand dunes could be anywhere, but necessarily evoke a margin of a mental or physical empire. Not just a tourist, Sartre is there as a Western leftist intellectual taking a trip to the land of the new other, the East, the Soviet empire, communism. the wretched in the sand merges the two historical events into a lecture-performance. Starting with an interpreted reading of the preface we continue with a workshop by engaging participants to discuss the performance. Myself, I am coming from a certain East, from the post-communist context of Bucharest, Romania. 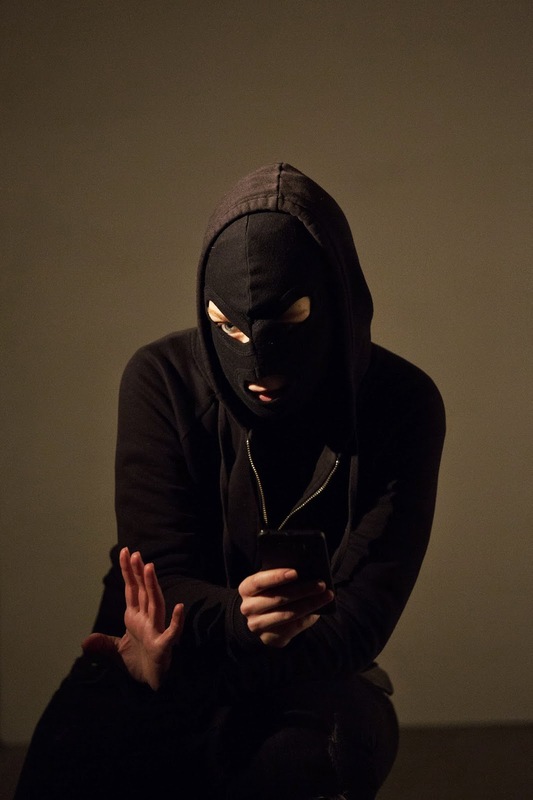 The performance explores what is at stake when such a performer, a woman, an Easterner, a post-communist reenacts Sartre’s anti-colonial writing in a remote location he once visited. Sand, Algeria, the West, Europe, margin, communist, empire, tourism are critically used to redefine our (myself and the participants) positions. Questions such as: What is North, South, West and East? Who is the Wretched? How Western/European do the participants/public feel? And what is this Europeanism: guilt, shame, pride, desire? will be put forth in the workshop. >>> The Wretched in the Sand. Nida dunes panorama. >>> Excerpt from Jean-Paul Sartre’s preface to Frantz Fanon’s “Wretched of the Earth”. (…) You know well enough that we are exploiters. You know too that we have laid hands on first the gold and metals, then the petroleum of the ‘new continents’, and that we have brought them back to the old countries. This was not without excellent results, as witness our palaces, our cathedrals and our great industrial cities; and then when there was the threat of a slump, the colonial markets were there to soften the blow or to divert it. Crammed with riches, Europe accorded the human status de jure to its inhabitants. >>> Captions from „The Wretched in the Sand” performance, video, 18 min. From a legal point of view, there is an important distinction between radical politics/direct action and art. In the contemporary Western legal systems, art is seen as a fundamental right. There is therefore a tendency to tolerate, legalize and defend something that is considered art. Enacted radical politics are always directed towards forms of governmentality, and the most cohesive expression of this governmentality is the law. Take the form of revolution as the privileged form of enacted radical politics: it is fundamentally illegal. It is this definite distinction between the tendency of legalizing art and illegalizing radical politics that is at the core of the configuration of the harmlessness of art. On the verge of the re-emergence of nationalisms due to recent geo-political changes, the Other Us is an attempt to draw a critical political position towards national identity. Organized through an open call to participation, the workshop gathered about 40 participants including about 10 facilitators. The program included artists, social scientists and activists that engaged in various forms of discursive exchange with the participants and public. 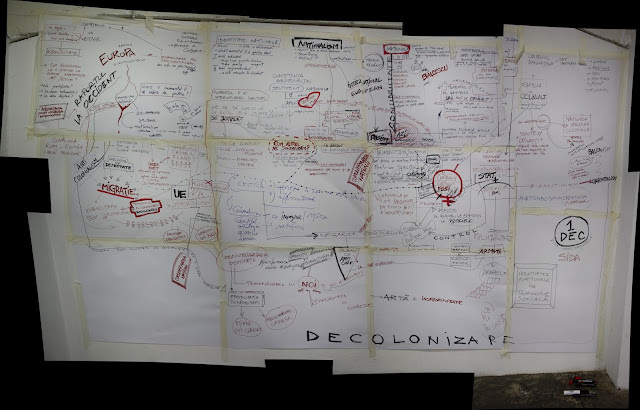 By reconfiguring identity politics and through a practice of active critique, the participants of the workshop engaged in a process of re-imagining national identity and the politics of art in the makings of this identity. The workshop was composed of three slots: 1) a program of lectures and debates, 2) a performance with alternative (other) flags created by participants and 3) an exhibition open to the public consisting of interventions and resources developed throughout the duration of the workshop. Facilitators: The Feminist Reading Circle (Cercul de Lecturi Feministe), Irina Costache, Florin Poenaru, Ovidiu Țichindeleanu, Cristian Cercel, Marian Ursan, Ovidiu Anemțoaicei, Mihai Lukacs, David Schwartz, Alice Monica Marinescu, Simona Dumitriu, The Fan-Club of Romanian Successes, (Fan-Clubul Reușitelor Românești). The Circle for Feminist Readings (Cercul de Lecturi Feministe) inaugurated the workshop with an open session on „What is the nation?” starting from a reading of Nira Yuval-Davis' Gender and Nation and developing the inherent genderized structure of the nation-state. Irina Costache's intervention, “The Fathers of the Nation: the European dimension of attempts to limit access to abortion” effectively illustrated the real anti-women consequences of nationalism. The role of affect and the genderized affective roles in the “Love for the Nation” were explored by Florin Poenaru. Ovidiu Tichindeleanu outlined the possibilities of linkage with the local Romanian context of post- and anti-colonial concepts and struggles for creating a new, emancipatory “Us”, situated in a geo-political context. Through a visit to the National Military Museum organized by the Fan-club of Romanian Successes (Fan-Clubul Reuşitelor Româneşti), the contemporary institutional textures of nationalism were explored in the historical representation of the military men of the nation. A historical approach was also conceived by Cristian Cercel with his analysis of the foundational text of the Romanian Proclamation of Independence, the same text that marks the 1st of December, the nowadays national day. Ovidiu Pop together with Veda Popovici sketched a portrait of the national subjectivity by investigating its creation by 19th century scholars and revolutionaries. The status of the national day was problematized by Marian Ursan as he talked about the difficulties encountered by AIDS activists such as himself in the Romanian context because of the coincidence of the AIDS international day with the Romanian national day. The position of the “Other” was also tackled by Mihai Lukacs and Ovidiu Anemţoaicei in a theoretical approach on the body and bodies of Self and the Other. The debates and lectures series of the workshop ended with a lenghty discussion on the political potential of art and its relative harmlessness in the context of national identity formation (with Simona Dumitriu, Alice Monica Marinescu, Veda Popovici and David Schwartz). Below: mind map created during the workshop by the contribution of all participants. We have dutifully celebrated the 1st of December (the alleged Romanian National Day). With a talk on the situation of AIDS-diagnosed people in Bucharest. The workshop for reimagining identity has ended. From the Other Us remain various flags, video and written documentations, read and unread books, messages on walls, drawings, mindmaps and some blue, yellow, red canvas. Irina Botezatu, Larisa David, Răzvan Drăgoi, Simona Dumitriu, Ileana Faur, Veda Popovici, Jean-Lorin Sterian, Alexandra Terzi, Daniel Tristan, Roxana Vasile. the Alternative Library (Biblioteca Alternativă), the Library of the Fan-club of Romanian Successes (Biblioteca Fan-Clubul Reuşitelor Româneşti), Larisa David, Ger Duijzings, h.arta, Mihai Lukacs, Arnold Schlachter. the Other Flags from veda popovici on Vimeo. 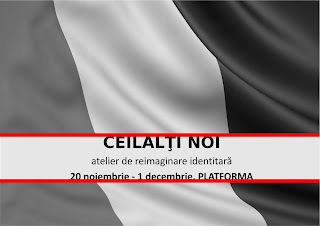 part of the Other Us/Ceilalti Noi project, Platforma art space, December 2012, Bucharest. The Blind Museum presents: The Tree Under Which I Grew. Within the framework pf the Blind Museum, a careful research was initiated to find out the inner genealogy of the Department of Painting of the National University of Arts in Bucharest. For this, we have chosen all the professors that have been educated at this department and/or have educated future professors. Thus, the selection purposefully leaves out the persons that have not been educated at the Painting Department and who have not had students that became professors at the same department. However, even with this omission, the people selected form the majority of the professors that have taught at this department. 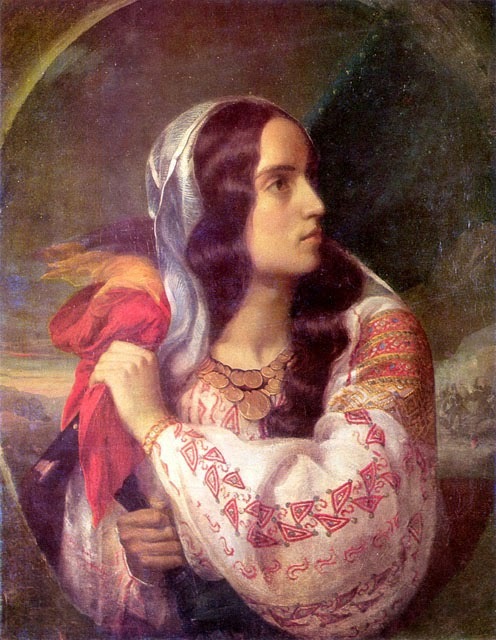 Indispensable to the representation of the nation-state, the Academy of Fine Arts in Bucharest, the today National University of Arts, has from its inception considered the painting department its cornerstone. In this disciplinary model the central figure is the Master or the Professor. His function is a key position for establishing the norms for the figure of the modern artist. Our research has followed various embodiments of this function. The multitude of names designating these embodiments pertain to various working styles, attitudes and mentalities. Only one dimension seems to be common: their masculinity. the Blind Museum presents: Future Exhibition Preview. part of the Open for Inventory collective project, Platforma Contemporary Art Space, October 2012.Participants: Marina Albu, Emil Avasilichioaiei&Sabin Gârea, Ștefan Bandalac, Raluca Croitoru, Larisa David, Marian Dumitru, Ileana Faur, Cosmina Ivanov, Iulia Mocanu, Veda Popovici/muzeul orb, Diana Ursan. The project consisted of the exploration of the collection of Romanian art of the National Museum of Contemporary Art by a group of artists that eventually developed works/interventions/concepts starting from the material found in the deposit. As a result, a number of artworks from the 70s and 80s were taken out of the deposit and exhibited. The Blind Museum's intervention in the collection was to select works pertaining to the nationalist tendency of the 70's and 80's and to exhibit them facing the wall, in what seems to be an exhibition that is just about to be mounted. The "Future Exhibition" is a glimpse into a not-so-improbable future where nationalism is again in the institutional spotlight. Each artwork awaits to be hung on a nail hammered in the wall just above it. Details: "Vasile Pop N., Hommage to the Great Unification, 1983" (left) and "Patriotic composition" (right). On the back of each artwork there is the title. The audience is left to imagine how the artworks actually look by reading the titles, and thus participating in their actualization. The new Bezna covers the controversial Shelter at the House of People events. READ IT! FEEL IT! SPREAD IT! BEZNA @ truth is concrete in graz. 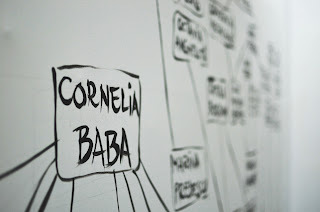 With: Valentina Desideri, Vali Zaharescu aka The Romanian Bum, Franco Bifo Berardi, Aparat Security, Elena Adam (SamuSocial), Mihai Lukacs, the Bureau for Melodramatic Research, Akseli Virtanen, Florin Flueras, Alexandru Gurita, Caroline Keppi-Gurita, Ion Dumitrescu, Eva Peron, Cosima Opartan, FRR. - Simple yet Nourishing Food - Simina Guga, Ovidiu Anemțoaicei, Ștefan Tiron. That what had to be done in my country was nothing less than a Revolution. 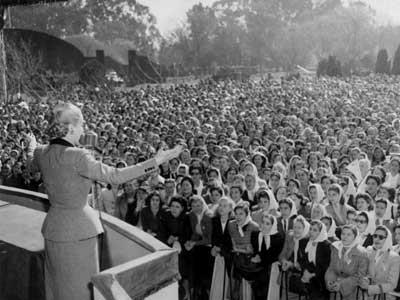 It is important to talk about “Evita”, and not out of pride, but because the one who understands “Evita”, can more easily understand the descamisados, the people themselves, and it will never feel of itself more than it is... Never will it become oligarchic, the most feared thing that can happen to a Peronist! 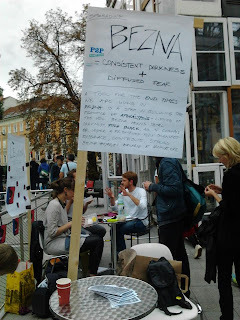 Fragment from "What is Eva P.?" There is a great prophecy which says that in the end times, the prostitute will lead the world. Those are the times of Apocalypse, the lifting of the veil, the times of dis-order and chaos. Eva Peron was the closest to the fulfillment of such a prophecy, however authoritative agencies kept his-story going and the fantasy postponed. 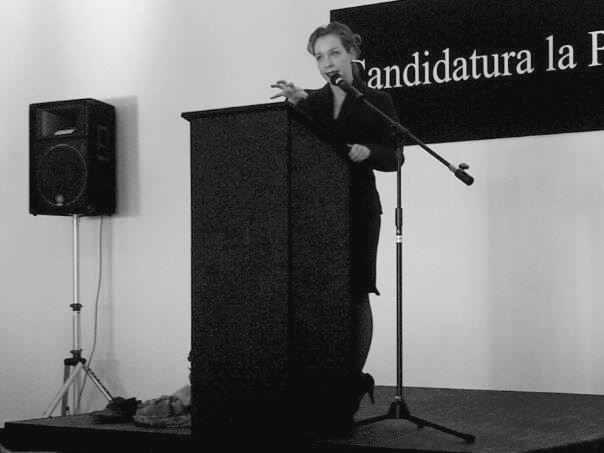 Called upon at the Shelter, Eva Peron becomes Eva P., an incantation for the reality of the Apocalypse prophecy. The time of the AntiRepublic haunts our present. It is there in the anti-communist ideology, in the virulent demonization of the looser of the Cold War, the so-called anti-democratic, communist East. It is there in the recent fall of the so-called Arab dictatorships. It is also there, in the visions of anarchists of all times and now in the practice of the ones in Greece. The AntiRepublic is also so present in the measures of radical neo-liberals that prophet the reign of the free market. But most of all, the AntiRepublic is already present everywhere in what is obvious to many: the failure of representative democracy. Eva was the first of her kind to vote but eternally enable to be voted. She is always just about to be named the Leader. Eva P., a ghost of true representativity, is powerless, she represents no real multitude. She is just an image of the Other, the one perpetually out of the space of authority, the imperfect powerless double. Brought to the Shelter, Eva P. is the model of anyone becoming a candidate for leadership and never a leader, the perpetual candidate for the great position of presidency, an archetype for the times of the AntiRepublic, when everybody will be a candidate and nobody will be president. It looks like what we, The Presidential Candidate, have been anticipating in the last years, with our "no hope" messages and slogans, is already at work. This is not perceived as an eccentric, provocative vision anymore, it is the banal reality that everybody can feel. So what now? What’s happening when you give up hope and you are pushed into the corner? There is a feeling of urgency, fundamental issues need to be immediately confronted and we will do exactly that. 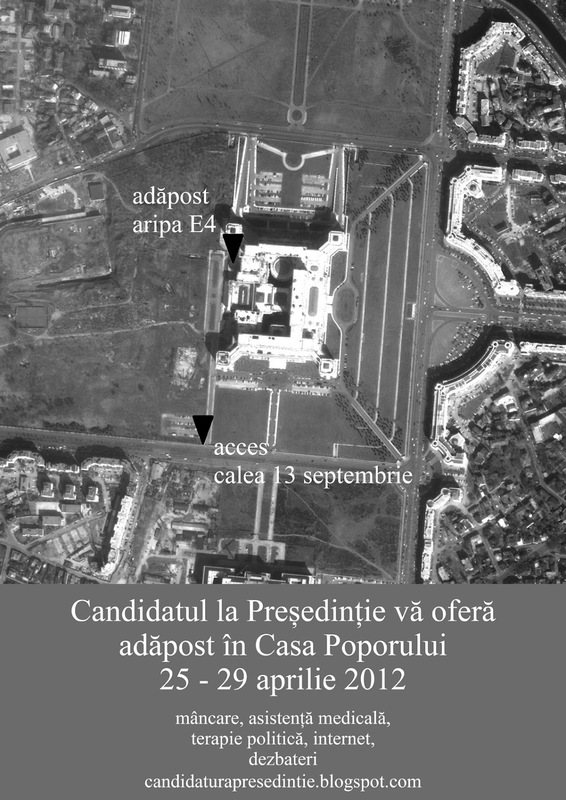 The House of the People (Ceauşescu's Palace) will be transformed temporarily into a real house of the people, where, for a few days, free education, free health services, free food, political therapy, a bit of everything that now is disappearing, will be provided. Still, there is a sensation that it's too little and, maybe, already too late, so we don’t know if we can avoid adding a dystopian dimension to the whole situation. The events within the House of the People will be a good opportunity for thinking the present and feeling the (no) future in this first Postspectacle shelter. Participants: Aparat Security, Franco Bifo Berardi, the Bureau of Melodramatic Research, Valentina Desideri, Ion Dumitrescu, Florin Flueras, Simina Guga, Alexandru Gurita,Caroline Keppi-Gurita, Mihai Lukacs, Cosima Opartan, Eva P. & Veda Popovici, the Presidential Candidacy, Elena Adam & Samu Social, Iuliana Stoianescu, Akseli Virtanen, Vali Zaharescu aka the Romanian Bum. Details on the program here. A new, fascinating issue crossing apocalypse with the January-March protests in Bucharest. fragment from "The Carnival, the Spectacle and the Non-event"
Tons of white, cold matter still cover the city. It feels cold, hard and deadening. Snow has become from an object a subject. It determines our lives, our needs, our actions and even politics. The few protesters who still remain in the streets sometimes sing: „The Souls melt the the Snows”. They already feel that the snow is the new body, the new flesh of the revolts, as the oppressive State-Media duo tell us. Carne vale, goodbye to the flesh is now a somber perspective. We are the snow and the snow should be cleaned, collected and disposed of. 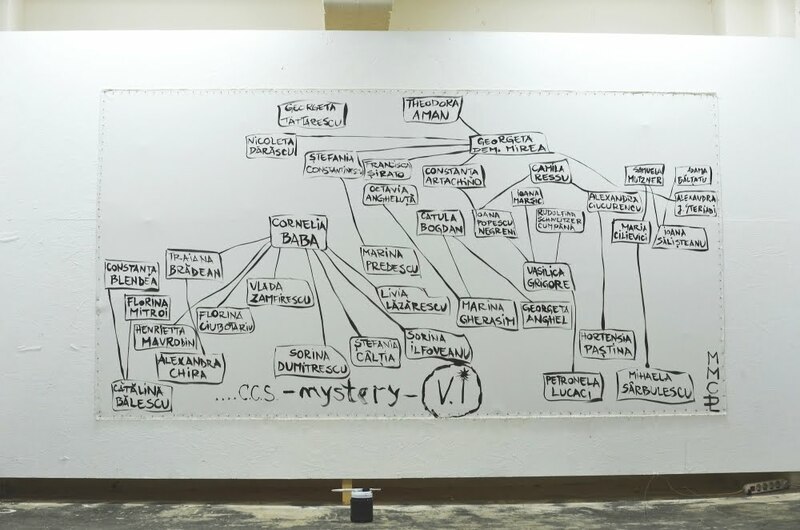 On Friday, the 16th of March 2012, the artist activist group Voina (Russian: „war”) had a public presentation at the National Museum for Contemporary Art situated in the House of People in Bucharest. Each person attending this event had to pass through a control of his/hers belongings and a body control through a metal detector, including the Voina artists. They were even longer and more thoroughly searched. The reason for this is that the building is a military objective. A space totally dedicated to State authorities, it hosts various institutions of „national importance” like the Parliament. We consider the event a invitation to war. The war is against today's form of the Romanian State, a police state that has progressively straighten its repressive character in the last six months. The fundamental right to protest and contest state authority has been and still is seriously broken. Too many activists and not only have been picked up and fined abusively and even physically assaulted by the military arm of the State, the privileged Jandarmeria. Inside the House of People, the war can only be symbolic, a representation of that real war through which the protest is, as each day passes, domesticized and annihilated. We have come to war in the only way we can: with toy guns. Just as freedom of speech is just a toy and protest just a simulacra in the eyes of the authorities. We played the role of harmless harlequins, toy-terrorists, a role that the same authorities attribute to artists. Responding to a symbolic war invitation, we try to push the limits of security and surveillance at the security check of the Museum. The toy guns are confiscated at the entrance, the art gesture is amputated in the hallway of the Great House. The reason: with toy guns one can threaten and create panic. 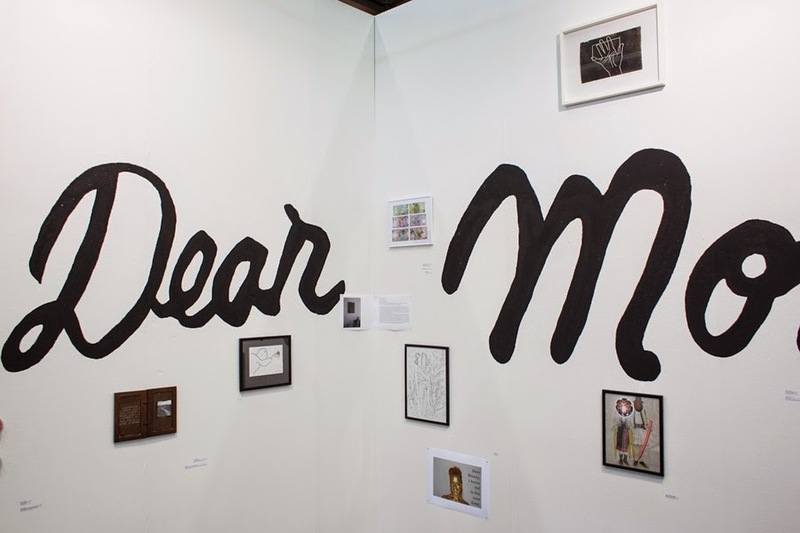 In the space that the State dedicated to contemporary art, contemporary artists are not welcome if they undermine its authority. Two pistols out of five manage to get across the tough security check. Throughout the presentation, anyone could observe the other guns left next to the metal detector. At the first floor of the Museum, the Voina presentation is about to begin. At this moment, we place ourselves in front of the obedient audience, two of us holding our guns at sight. The others are wearing the message: „I came to Voina, but this plastic gun had to stay at the security check of the Museum”. Although we threaten the audience with our guns, nobody panics. 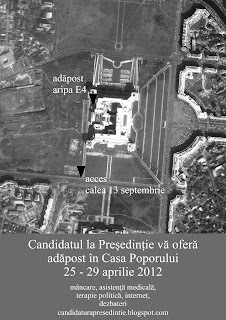 We are perfectly safe in the most guarded building in Romania. The limits of security and surveillance seem unreachable. A threatening as a simulacra and the neutralization of any conflict, this is the only Voina possible at the House of People. Arnold Schlachter / Bogdan Drăgănescu / Mihai Bumbeș / Mihai Lukacs / Veda Popovici. An extended version of this text was presented at the Anarchist Studies Network Annual Conference, 3-5 September 2012, Loughborough University, U.K.